Featured from right to left: Brad, Lauren, Matt, and some random guy who snuck up onto the dais. Security was nowhere to be seen. 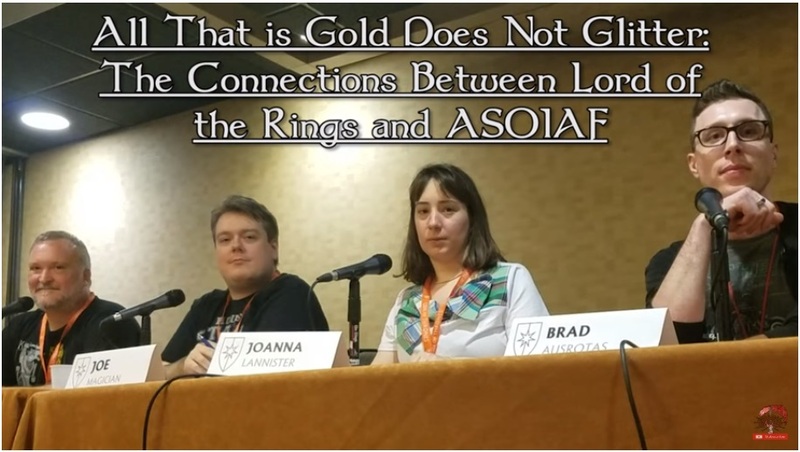 I’ve included a link to the All That is Gold Does Not Glitter: The Connections Between Lord of the Rings and A Song of Ice and Fire panel’s audio. I was a participant on the panel, along with /r/asoiaf Reddit moderator Matt (aka Joe Magician), Lauren (aka Joanna Lannister on Tumblr) and convention-running Mischief Management bigwig Brad Ausrotas. I appreciate Matt for putting the audio up on YouTube, the panelists for their expertise, and the audience for their engagement. Full disclosure: I have not listened to the audio from the panel (other than what my ears heard during that day) but I’ve gotten great feedback from Twitter friends who could not attend, have listened to Matt’s audio, and announced that we crushed it. Talking about Lord of the Rings and the Game of Thrones books is a huge topic, and certainly fifty minutes is an inadequate amount of time to cover that topic exhaustively. Near the end of the panel, someone asked if there were symbolic connections between the One Ring and Azor Ahai’s Lightbringer sword, and I almost passed out from the frustration of not being able to explore that with the audience.